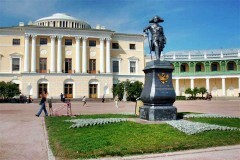 Pavlovsk and Pushkin are the neighbour cities, which borders are connected. Catherine’s Palace was started in 1717 as a small residence during the reign of the Empress Catherine I, but 40 years later, it was reconstructed by the order of the Empress Elizaveta Petrovna. The palace interiors host the world famous Amber room (Amber Chamber), that was completely restored to it’s historical look. The Paul’s Palace in the city of Pavlovsk was built in 1784 by the architect James Cameron for Paul, the son of the Empress Catherine II. The landscape park of Pavlovsk named to be the largest in Europe, and the best in the means of planning.